The SS Special Camp/Concentration Camp Hinzert existed from October 1939 to March 1945. The camp, located on the Hunsrück mountain range, was named after the closest village, today named Hinzert-Pölert. The closest city is Trier. The camp was originally established as a police detention camp for workers who built the Siegfried Line and had become delinquents according to the Nazi’s understanding of delinquency. It was officially named SS-Special Camp Hinzert. Unlike other police camps at the Siegfried Line which were closed in 1940, the SS Special Camp Hinzert was not closed. 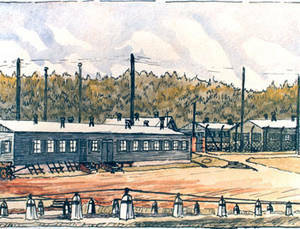 Instead, on 1 July 1940 the camp was put under the jurisdiction of the Concentration Camps Inspectorate (CCI), a division of the SS, and transformed it into a “transit camp”. Many French, Belgian, Dutch and Luxembourg detainees passed through the camp before they were sent to the concentration camps at Buchenwald, Natzweiler or Dachau. The camp was abandoned by the Nazis in March 1945. Some prisoners were forced to march to the Buchenwald Concentration Camp. Other prisoners remained behind in the camp, unguarded, until they were liberated by American forces.